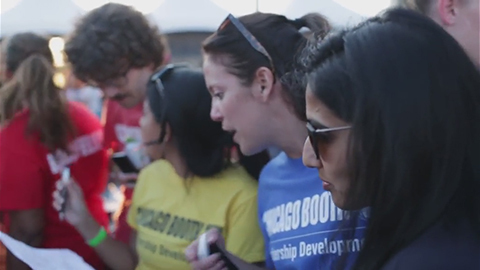 Just as our intellectual culture—where no one accepts the status quo—defines Chicago Booth, so too does it shape student life. Our dedication to constant searching, challenging, and testing carries over into a community that pushes students to be the best they can be. At Chicago Booth, you'll be part of a group of people who share a passion and curiosity for exploration—going beyond their comfort zone and emerging on the other side stronger, more self-aware, and self-assured. Fellow students. Staff. Faculty. They’ll push you, support you, stand by you, have your back, cheer you on, and lend you a helping hand. What Booth offers is a community culture that is intense, exhilarating, and utterly transformative—something our students recognize from the moment they step on campus.